We are officially empty in our nest! Sophia went to school last week. Though there have been many trips to see her and bring "stuff," the house feels as if it has tripled in size. I'm cleaning piles of stuff that's become invisible, and the house is staying a lot more tidy than it did this summer. 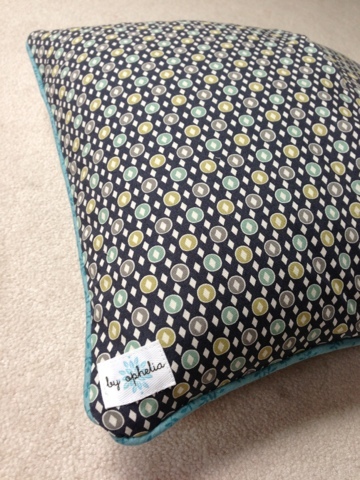 This pillow was just a little self-indulgent project I threw together this weekend. We were going to visit Alexandra, a 90 minute drive away, in order to check out how she is doing and drop off some winter clothes. Rather than spend the 3 hours in the car doing almost nothing, I quickly cut out 80 colored squares and 40 white squares in order to make a pillow cover. I did the gluing of the pieces in the car Saturday, and Sunday, put the thing together. Good news! I’ve gotten back in front of the longarm machine and have put a serious dent in the quilting of my McKenna Ryan Chicken Coop quilt. 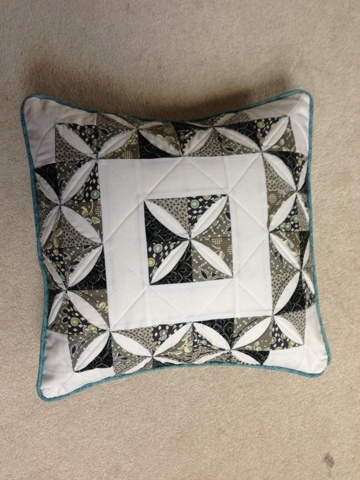 It wasn’t bad at all, and I really need to do a little more quilting in order to chip away at the backlog. I think in the summer, I just can’t bear to stand up there, A/C or no, to quilt. I’ve got some inspirational new books on free motion quilting, which seems to be all I’m interested in biting off. I also got the quilting discs from the Electric Quilt Company in order to try to inspire more custom quilting ideas for good block quilts. I need a push in order to quilt any of the BOMC quilts I’ve got waiting in the wings. I’ve had paralyzing trepidation when it comes to quilting large quilts. I must work on breaking through whatever barrier is keeping those in my “to quilt” basket.